Vietnamese cuisine features a combination of distinctive flavors. From the fish sauce, lemongrass, vegetables, and soy sauce, your taste buds will come alive. 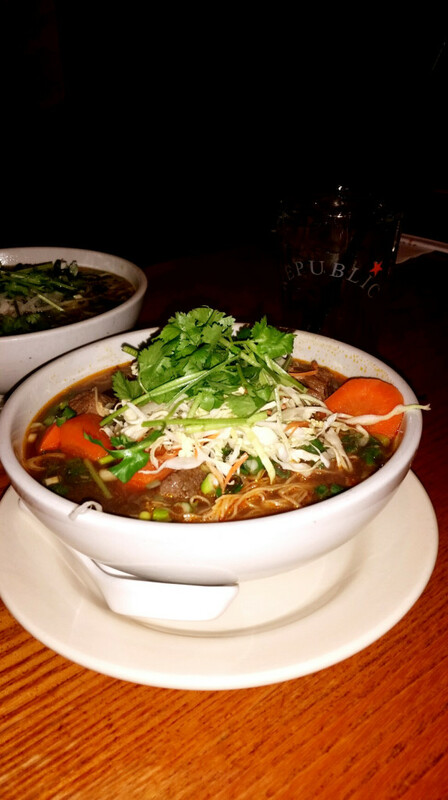 Republic is one of the best restaurants in New York City that offers great Asian Fusion dishes. On a cold snowy day, stop there for lunch or even dinner and grab yourself a Pho. It is a noodle soup consisting of broth, linguine shape linguine-shaped rice noodles, herbs, and meat.It is served with either beef or chicken. Pho is a popular street food in Vietnam. Southern Vietnamese eat it for breakfast and occasionally lunch, whereas northerners eat it at any time of day. Fanatiqueof ate it for Lunch! Add Republic on your list and visit them. You will not regret it. Photos of the dishes I enjoyed below.